I received a gift in the mail recently. Imagine my surprise when the mailman, who refuses to get out of his car because of the three Labradors and one Dauschund patrolling our property, showed up with a package for me. I find it puzzling that the mailman (who’s supposed to deliver rain, snow, or dead of night) won’t get out of his car to make a delivery due to the dogs but the UPS and Fed X guys have no problem interacting with our pooches. Toss ’em a treat and they’re pretty much ready to follow you home. But apparently the USPS doesn’t have a budget for doggie snacks. So it goes. Anyway, I just happened to be there when the guy pulled into the yard with the package. “I’ve got a parcel too big to put in the mailbox,” he said from safely within his SUV. I thanked him for driving in and accepted the package. The dogs sat looking expectantly as the car drove off. I went back into the house and opened the padded mailer and found a DVD from the Listening Point Foundation, a group whose primary goal is to preserve the lakeside cabin and conservation legacy of Minnesota outdoor writer, Sigurd Olson of Ely. I can’t remember if I’ve ever actually sent a donation to the Foundation. I’ve attended at least one of their fund raisers up in Ely and contacted them awhile back about donating some of my books for their silent auction. Don’t remember if we ever connected on my offer. In any event, I popped the DVD in my computer at work during lunch. Turns out, it was one of better lunches I’ve spent by myself in quite a while. Well, that’s not really true. I mean, yes, in the physical sense, as I sat at my desk watching the film, “The Wilderness World of Sigurd F. Olson”, I was the only person actually present. But there, on film, talking about conservation and writing and wilderness were Sig and his wife, Elizabeth. The short (28 minute) documentary is, as stated by a reviewer on the packaging, “not a biography in the strict sense.” The narrative is not a linear, birth-to-death rendition of one man’s life. It’s more a taste, a sampling, of the places and influences and people that allowed Sig Olson, at age 57 to finally realize his dream of being a published author. 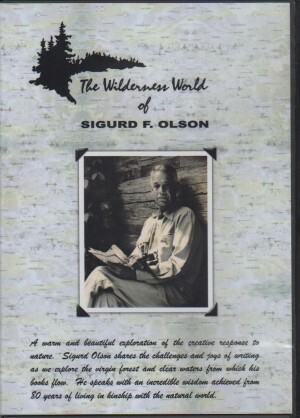 Like Norman Maclean (A River Runs Through It), Sig Olson worked at writing for decades before he found his voice, before he was a commercial success. He reiterates this theme time and time again in both the film and the audio interview clips that are extras on the disk. Perseverance rather than mere talent is the hallmark of a career in writing according to the sage of Ely. Here are a couple snippets from the audio reflections of an accomplished writer and author. Now that sounds cliche’, too simple an admonition. But time and time again I’ve had folks approach me at writerly events and tell me, “Oh, I have a story I’d love to write. I just don’t have time. Maybe when I retire…” I smile and, hopefully, like Sig, I give them the benefit of the doubt. But the truth is, that, if I can find the time to write raising four sons, being a husband, teaching confirmation, working full time, coaching soccer and hockey, and taking care of 135 acres of woods, anyone can. The issue isn’t time: it’s desire. The “want” of Sig’s simple sentence is far more complicated than it appears. In another excerpt, Sig responds to the interviewer’s observation that to write, one needs an internal desire or “pressure” to exert itself, to cause the act of writing. Sig agrees. The writer can’t rely on an outside influence, such as a publisher or agent or money, to push the writer to write. And as I indicated, Sig is very modest about his late-in-life commercial success as an author. This ties into my observation, one shared, I think, by Sig, that a writer’s greatest attribute isn’t necessarily talent. It’s perseverance. In my own case, success in writing was a long time coming. I keep all my rejection slips, of which I have millions. There’s a lot more to the audio clips than reflections on writing, including campfire conversations, discussion of place, and short interviews about Sig’s fervent belief in the value of wilderness. Writing right up until his death while snowshoeing in the woods surrounding his Ely home at the age of 82, Sig was able, despite the lateness of public recognition, to not only piece together a credible career as an outdoor writer: he was a leader in the conservation movement with respect to the establishment and preservation of both the Boundary Waters Canoe Area Wilderness and Voyageur’s National Park, two gems of conservation ethic in NE Minnesota. He was and is a man worthy of emulation.